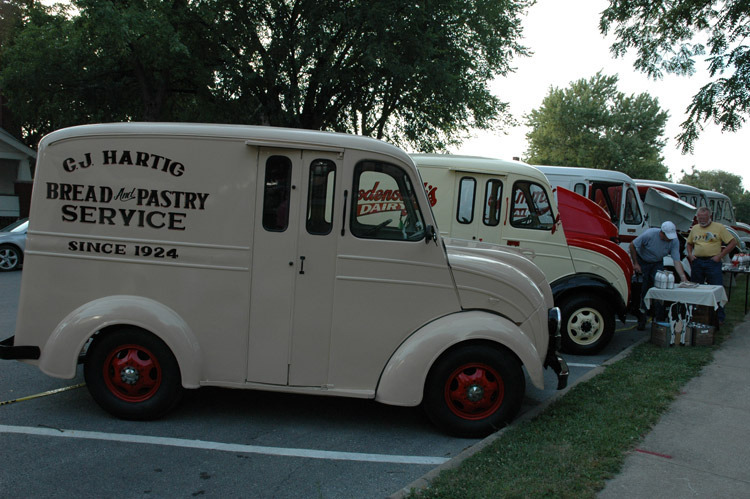 Our mission is to promote the preservation, restoration, operation and history of Divco Trucks, Milk Trucks, and other Multi-Stop Delivery Vehicles. Founded in 1991 and incorporated in 1998, The Divco Club of America today is a non-profit, educational corporation with members all over the US and Canada. Join us July 10 - 13 in Dublin, California for DivCon 2019. You won’t want to miss this convention. We have a lot of fun stuff lined up for you to enjoy. At the motel - Shake & Howdy, food, ice cream and truck talk. Tour a great car collection. Visit the Rosie the Riveter Museum and lunch. Cross the Golden Gate Bridge and tour the Visitor Center. Visit Pier 39/Fisherman’s Wharf. Then back to the motel for dinner, more ice cream, game time, bluegrass and truck talk. Tour Jelly Belly Factory. Tour the Blackhawk Auto Museum. Then back to the motel and get ready for our big display night. We meet up at the Dublin Heritage park area and display from 5 to 8 PM. Alameda County Fire will make food available from their 1927 REO Speedwagon Firetruck BBQ. Clover Dairy will be on hand with their newly restored Divco and some treats for us. Loard’s of Concord will be on hand with ice cream. Bluegrass music will be there. Public Display from 9 to 1 PM in downtown Pleasanton near Meadowlark Dairy and the Farmer’s Market. Then you are on your own until the Divco Convention Banquet at 6 pm at Frankie Johnnie & Luigi Too for some good food & fellowship with fun door prizes and auction. Of course, some more truck talk. The annual 2019 Divco Club banquet will be held on Thursday, October 10th. At this time, it is expected to be at the Holiday Inn in Grantville, PA. For more information, contact George or Barb Parmelee at barbgeoparm@sbcglobal.net or call 203-266-5435 (leave a message). The 2019 fall Hershey, PA, Region Antique Automobile Club of America (AACA) swap meet and car show will be held on Wednesday, October 9th through Saturday, October 12th. The Divco Club of America now has a Facebook group page. Click here to join us. Dues are $30 per year for all membership types. It includes the next 6 issues of our newsletter, the Divco News, which contains articles about Divco and Multi-Stop History, restoration, operation and collectibles. Share memories with other fans. Our classified ads (see below) help you buy or sell trucks, parts, and memorabilia. And our letter columns help people with like interests keep in touch all across the country. Just mail your Membership Application Form with annual dues to the address below. Back issues of the Divco News are also available. Click here to pay your membership dues online. DCoA offers a number of Divco styled and logo* items, including shirts, belt buckles, and even scale model trucks. Proceeds from the sale of these items go to further club goals. You don't have to be a member to purchase, and you can shop online or by mail. Click here to see our current catalog. Sometimes something of interest happens BEFORE the next newsletter. To communicate more quickly, we publish the information here first. The Divco News Classified Section in each issue is the world's best place to buy and sell Divco (and other multi-stop) trucks, parts, and memorabilia. All classified advertising is always FREE to members. We also provide free ads to non-members with multi-stop trucks or parts for sale. We regret we are unable to offer "wanted" ads or "for sale" information to non-members, as our current club membership receives first priority for that sort of information. The information is also NOT available online. The Divco library contains thousands of pages of parts books, maintenance manuals, advertising materials, and production records. Photocopies are available for a nominal charge. We also have many parts sources available to assist with truck restoration and maintenance. Click here to send an e-mail request to the Club Library. The Divco Club discussion group gives members a chance to discuss their favorite Divco and Multi-Stop subjects online. "Trucks built by DIVCO and its successors, were once as much a part of the American way of life as baseball and mom's apple pie."